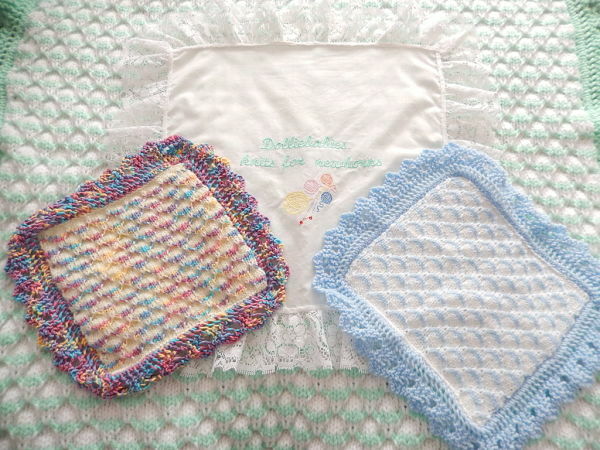 Instructions for a pretty baby blanket in multiple sizes. The smallest size is suitable for memorial purposes, whilst the largest sizes makes a lovely lap blanket for an adult who feels the chill on our cooler evenings. The stitch pattern is a lovely waffle style, making the blanket lovely and warm. This pattern has been designed by myself so it is in UK terminology. It does not follow the usual ‘shop bought’ format. There are 3 printed pages with clear and easy to follow instructions. All my patterns are tested by independent knitters before they are released, so every effort is made so that they come to you error free.